GUARD Net network controller is designed for using in the network and standalone access control systems. The controller has changeable functionality which is determined by the loaded firmware adjusted to the task. USB port allows you to configure the controller by simple editing of text configuration file. Previously you needed separate type of controller for each solution, now it's enough to get GUARD Net and install the firmware which is suiting for specific task. Detailed instructions as well as the minimum conductors at the terminals provides ease of installation and maintenance. Due to the three actuators (one relay and two MIS transistors) GUARD Net controller is perfect for management of the electromagnetic and electromechanical locks, turnstiles and barriers. Specific configurations provides connection to the activator lock which requiring a supply of different voltage polarity for opening and closing. A separate fire input increases fire safety since the activation of fire alarm unlocks the passage regardless of connection with the PC. A second RS-485 port implemented within the GUARD Net controller as a galvanically isolated RS-485 line repeater. Thus the long network circuit may builded as a multiple short galvanically isolated segments. 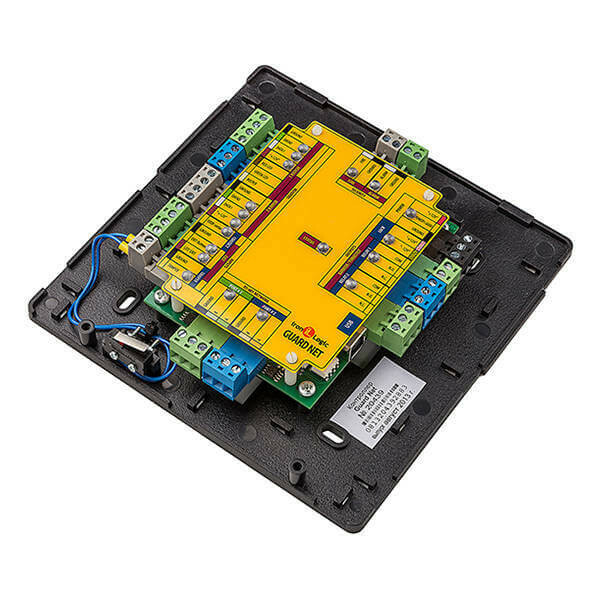 This greatly improves the interference protection and the software will take all the devices like connected to the same RS-485 line.